Konica Minolta South Africa, a division of Bidvest Office (Pty) Ltd, joined forces with CSI partner, Food & Trees for Africa (FTFA) to celebrate the United Nations’ (UN) International Day of the Forests. Taking place on 22 March this year, this global celebration provides a platform to raise awareness of trees and woodlands, while tackling issues such as deforestation and discussing the importance of trees and forests in our everyday lives. To commemorate the day, a team from the company’s Pretoria branch visited Uoane Primary School in Mamelodi-East, Pretoria, helping staff and children to plant 30 fruit and indigenous shade trees at the school. 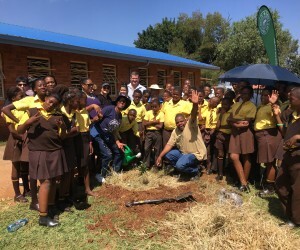 This forms part of Konica Minolta South Africa’s commitment to plant 1,380 trees over the month of March, with an additional 720 to be bedded down in Mamelodi alone. Pretoria branch attendees were welcomed to the school grounds with a procession of singing and dancing children, who informed guests of the importance of trees – citing impressive facts such as that two trees can provide enough oxygen for a family of four – on the process of photosynthesis and how plants make food. Pupils from Grade 6 and 7 in vibrantly coloured costumes then performed traditional Pedi and Tsonga songs and dances. Following the festivities, children and sponsors received an animated and practical demonstration on how to optimally plant a tree, plus recycle plastic bottles for drip irrigation, before getting their hands dirty and planting their own indigenous sapling. 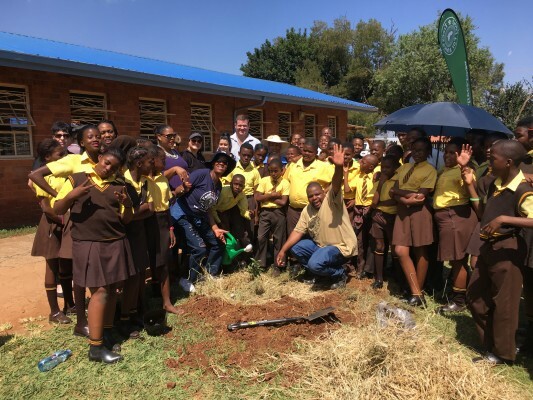 Konica Minolta South Africa has partnered with FTFA for the past nine years, planting more than 31,000 trees since 2008, a major contributor to the company’s carbon neutral status for the past four years.